Thirty years after being taken away from her parents by the state and given up for adoption, singer-songwriter Jenni Alpert went searching for her biological father. She finally found him: homeless, toothless, addicted. And a musician, just like her. With “Cami” Jenni Alpert and Don Logsdon. 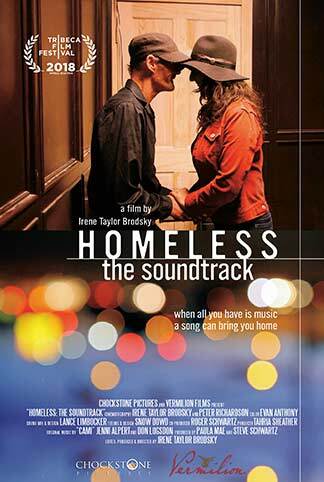 HOMELESS: THE SOUNDTRACK, a short documentary, is directed by Irene Taylor Brodsky and produced by Paula Mae and Steve Schwartz, and Irene Taylor Brodsky. The film had its world premiere at the 2018 Tribeca Film Festival, where it received a Special Jury Mention, and was awarded Best Short Film at the 2018 Nantucket Film Festival.